anxious so we want to be careful that his new home is calm and quiet. realize strangers make wonderful things happen for a small black tri aussie dog. ​Ozzy's adoption fee is $300 and he is located in the Portland, OR area. Annie is a lovely senior Aussie-Husky cross. Her owners sold their house and moved in two different directions, Annie was left on her own. Enter the World's Greatest Real Estate Agent to the rescue!! The woman who acted as the agent who sold the property is now acting as Annie's guardian and friend. She is wants to find Annie a home of her own for her retirement years. Here is what she says about Annie " She is the sweetest, gentlest , quietest dog ever. All she want is pats and love. " Annie gets along with the household dogs and is happy to meet new people and make new friends. She likes her dog bed and stuffed toys, enjoys time in the yard on sunny day. Annie is very affectionate and would love to bond with a new owner. She has touch of arthritis and her eyes have the slight cloudiness than many seniors get. Otherwise, Annie is very healthy and up to date on all her medical care. If you would like to have a sweet and genteel companion and give a hand to a senior dog, Annie is for you. If you are interested, fill out an adoption application and we will pass it along to Annie's guardian. ​RYDER is a gorgeous, happy, very active 1 year old border collie mix who loves to play fetch. He does enjoy bones/chew toys or he will chew on a shoe or two if not supervised. Children over 10 in the home only. While Ryder is friendly, he gets too excited and likes to jump up. ​A patient, but breed knowledgeable owner to build his confidence and give him direction that he looks for would be best for this handsome boy. His gorgeous coloring, adorable tan eyebrows and cute freckles on his nose will turn heads at the dog park. Crate trained and housetrained, although he does need to reminded. A consistent schedule will help. Ryder is approx. 40 lbs, neutered, microchipped, up to date on vaccines, rabies, heartworm negative and on preventative. As a puppy, he tested positive for distemper, but never had any symptoms or problems. No special care required. Extremely affectionate, lovable, alert and energetic 2 year old heeler would love a person to take him on adventures. Would make a great running and/or hiking partner. Good active energy on this spunky guy who knows when to settle down and relax at night for cuddle time. Very good house manners, not destructive inside or outside. Dog friendly and cat friendly. Housetrained- very good at going to the door to be let out. Crate trained. Sleeps thru the night in his own bed. Rides well in the car and likes to look out the window. Knows basic commands 'sit, stay, off and comes when you call his name'. Not a big barker, but will bark at dogs when he's on leash. Easily fixed with some training. Will climb in your lap and give kisses. Loves to get his chin and chest scratched. Enjoys his bed, stuffed animals, playing in the backyard with his rope toy and watching dogs and people walk by. He loves adults and would do best in a home without children. Tucker is 35 lbs, neutered, microchipped, up to date on vaccines, rabies, heartworm negative and on preventative. BANDIT is an extremely sweet, affectionate 1 year old Aussie Heeler mix. He's a very smart pup who really wants to please his people. Would enjoy walks and hikes with his person. Not destructive inside or outside and not a big barker. Knows basic commands; 'sit, shake, down' and would love to learn more! Dog friendly, cats are unknown. Likes treats, getting loved on and belly rubs. Handsome boy with gorgeous eyes that really speak to you. He needs some work to learn how to properly walk on a leash. His foster said he is the sweetest foster dog she has ever had!!! Bandit is 50 lbs., neutered, microchipped, up to date on vaccines, including rabies, heartworm negative and on preventative. ​Ruby is an adorable little red head. She is about 18 months old and 21lbs. She was a young mother & her babies have been adopted. Now Ruby is ready to start her new life. She is a happy girl. All wiggles. Ruby gets along well with other dogs and loves all types of people. She is house trained. She loves toys and is very toy and food motivated. She would do great in an active home. Hiking, agility, would be great. We aren't sure how she is with cats. Ruby is such a sweet and well mannered girl we think she would be a great dog to take to work with you. 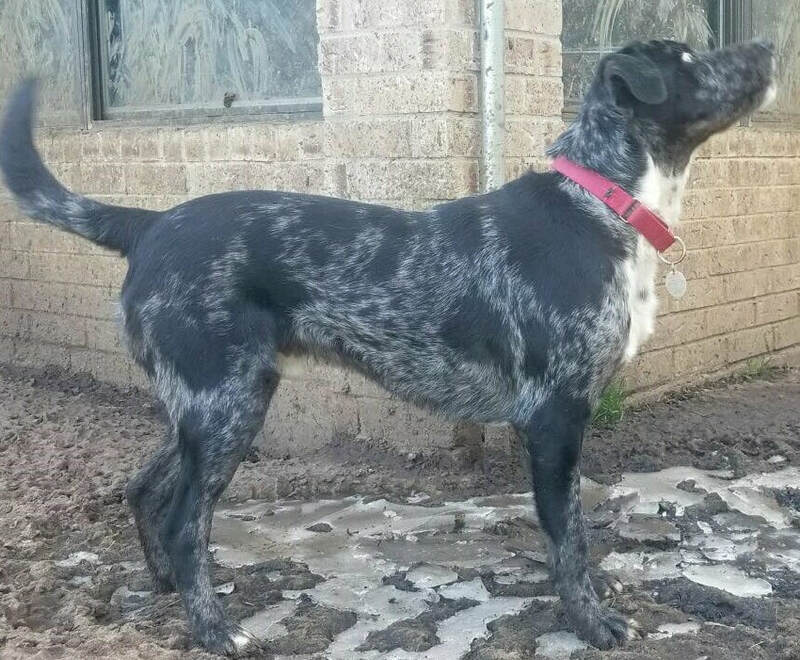 ​SIRIUS is a gorgeous, very affectionate 2 year old Australian Cattle dog looking for a family of his own to love. He loves to be outside, going for walks, runs, hikes and playing in the yard. Sirius is happiest when he's with his people, whether it's going on an adventure or relaxing on the couch. Enjoys being pet and giving kisses. Walks well on leash and can be easily trained to walk off leash, because he has good recall. He has good moderate energy and likes to play with toys, tennis balls and chew on bones. Would do best in a home with regular daily activity of walking and playing ball in the yard. Cat friendly and dog friendly with proper introductions. Knows basic commands - 'sit, stay, off, drop it'. Crate trained and sleeps thru the night. Not a big barker, but will bark when he gets excited. Not destructive inside or outside. While he is houstrained, he needs to use a belly band to remind him inside. He is living in a foster home with 5 other cattle dogs and 4 cats and gets along with all of them. Sirius weighs 52 lbs, is neutered, microchiped, dewormed, up to date on vaccines and rabies. He has completed heartworm treatment and will need to remain on heatworm preventative for life to stay heartworm negative. This handsome guy is Rex. He is about 2 years old & 45lbs. Rex is house trained & crate trained. As you can see from his pictures he loves toys & he loves to play. He gets along well with other dogs. We don’t know about cats. Rex is moderately active. He likes to play & would love to hike & stuff like that but he’s also pretty happy to hang out too. Need a gardening buddy? Rex will be there to keep you company. He’s that kind of guy. Rex is reserved with strangers. Rex would do best in a quiet home without a lot of people traffic. He prefers his family & meeting new people makes him nervous. He is affectionate & loves to snuggle. He will be your faithful companion. Handsome 2 year old Catahoula looking for an active home to go hiking and take him on adventures. Oreo is a sweet, gentle, happy boy who wants his own family or person to love. He will gently put his nose under your hand as he wants you to pet him and show him affection. Loves to give hugs and kisses. Good high energy boy who would make a great running partner. Enjoys playing and running outside with other non dominant dogs. Not a big barker, but will bark when he sees cows and squirrels. House trained and crate trained. His beautiful coat and one blue eye and one brown eye make him a knockout. But it's his heart that's so ready to love and be loved that makes him so special. He walks well on leash and rides calmly in the car. Knows some basic commands and willing to learn more if you teach him. A home with older children only please. Oreo is 50 lbs. neutered, microchipped, up to date on vaccines, rabies, heartworm negative and on preventative. DOLLY is a 1 year old Australian Cattle Dog mix looking for her own active family to take her on hikes and adventures. Loves playing outside in the yard and cuddling up with her person. She was named Dollface by the shelter staff and her foster mom said she is exactly that: a loving doll face. Dolly is a very gentle, very loving, very happy girl. Likes to gather her toys and easily entertains herself as well as you while watching her cuteness. Dog friendly and non reactive to cats. Housetrained (uses the doggie door) and crate trained. Rides well in the car. Not a big barker. Walks well with harness on leash. Sleeps thru the night on her own bed. An active family with a fenced yard would be ideal for sweet Dolly. She does like to jump up to greet you and give kisses, so older children only would be best, so she does not knock them over while she is learning. Dolly weighs 40 pounds, is spayed, microchipped, up to date on vaccines, rabies, heartworm negative and current on preventative. There is a $150 transport fee in addition to her adoption fee to make this sweet doll part of your family. Affectionate, happy, playful 8 month old puppy weighing 50 pounds. Sampson is a very lovable boy who enjoys meeting new people, getting his belly rubbed and giving kisses to everyone he meets. Dog friendly guy who likes to play with dogs his own size or larger. He knows basic commands like 'sit' 'stay' and is a quick learner when treats are involved. Even gives 'high five' with his paw. Crate trained and goes potty outside when you take him. Enjoys car rides and is well behaved in the car. Sampson is not a barker and is not destructive inside or outside. He is curious about cats, but not aggressive towards them. Good medium puppy energy level, but knows how to chill after he's exercised. Walks 'ok' on leash - pulls a little at first because he's excited to get out and explore the world. Sleeps thru the night on his dog bed. Although he is very child friendly, he doesn't always remember he's a big puppy, so a home with children over 6 would be best, so he doesn't knock any little's over. He will probably grow to about 55-60 lbs. Sampson is neutered, microchipped, up to date on vaccines, including rabies, heartworm negative and on preventative. Pluto is a 1 year old, very affectionate boy looking for a companion to include him in their life and cuddle up on the couch to watch movies. Very easy going, loving, well behaved boy just wants to be by your side, wherever you go. He likes to go for walks, can go with you for short runs or hikes, car rides - you name it, he's up for it at a moments notice, as long as he's with you. So a person who works from home or is retired and looking for a best friend would be best. Very dog friendly with both big and small dogs. House trained and not destructive when left alone. Crate trained, although he's not fond of the crate and has proven he can be trusted outside of crate. Walks well on leash, but will pull to go say 'hello' to a passing dog. Knows basic commands (sit, stay, kennel and comes when you call his name. Loves carrots and any treats. A home without children would be best, as he is uncertain of their quick, loud movements. No cats - they are too fun to chase. Pluto was a scared, defensive boy in the shelter, but has learned to love, trust and appreciate human attention. He really wants to please his people. His new family will need to be patient the first few days to allow Pluto to bond with you and gain his trust that humans are good. Once he bonds, he bonds strong and for life! Pluto is 50 lbs, is neutered, microchipped, up to date on vaccines and rabies, heartworm negative and on preventative. Do you like unconditional love, affection, going for long walks and cuddling? Maddie is a very happy, beautiful, smart 2 year old Texas Border Collie mix who is looking for a human companion of her own to love, with no other pets to share the attention. She is very affectionate and will give you kisses, lots and lots of kisses. Maddie loves to go for walks, play in the yard and cuddle up on the couch with you for a movie. A home with previous dog experience and the ability to be the pack leader/alpha would be best for this loyal girl. Maddie knows basic commands like 'sit and crate' - she will willingly go into her crate if told. She is house trained and walks well on leash. Maddie would be happy to sleep in bed with you or at least in your room. Pretty good inside house manners, although she would love to eat your shoes if you let her. She is not a big barker, but will alert you to someone outside your home (a great theft deterrent). Maddie will keep your home safe from bad guys. While she is good with children, she doesn't know her size and can knock over small children so we recommend a home with older children, if any. Maddie is dog selective and not fond of cats. Maddie is 60 lbs, spayed, up to date on all vaccines, heart worm negative and on preventative. Please only inquire if you live in the Dallas/Ft.Worth area. Her foster mom Linn, would love to answer any questions you might have about Maddie. DO NOT CONTACT WESTERN AUSSIE RESCUE ...WE HAVE NO FIRST HAND KNOWLEDGE OR THIS DOG Rocky is a sweet and goofy heeler mix boy who has found himself looking for a new home after one of his owners passed away. Rocky just loves his people; you will be the apple of his eye as long as you’re giving him attention! He will always greet you with many wags of his curly-q tail (which actually spirals round and round). Otherwise, he’d love to curl up at your feet or follow you around the house. Rocky would love to be the only dog in the house as other dogs make him a bit anxious (unless you want to bring home his sister, Shannon, too!) and he should not share a home with any small critters as they are just a little too interesting to him. He is also a pretty quiet guy; he’ll bark if someone comes to the door and is a little wary of strangers in his home, but not at all in an aggressive way. Rocky is around six years old, housetrained, crate trained (and fine left alone for the day), neutered, and up to date in his vaccinations. DO NOT CONTACT WESTERN AUSSIE RESCUE ...WE HAVE NO FIRST HAND KNOWLEDGE OR THIS DOG Shannon is a sweet and shy lovebug. This heeler mix found herself looking for a new home after one of her owners passed away. She takes a little while to warm up to new people (particularly men), but will just stay in her own space until she’s ready to come to you. But once she’s decided you’re ok, this girl will be your best friend and come to you for gentle pets while she gazes into your eyes and tries to give you kisses. She would love to have a person (and/or perhaps another dog with the right introductions) who could be around most of the time, but she does very well in a crate when no one’s home. In fact, she LOVES her crate…it’s her favorite place to hang out whether or not you are home. She came into rescue with her brother, Rocky, and we feel they could probably be adopted separately or together. Shannon is pretty quiet, but will sometimes alert bark if she hears a car pull up or something go bump in the night. She walks very nicely on leash and only pulls for really great smells or critters on the run (so no small animals in the house for her). Shannon is housetrained as long as she is given regular potty breaks, around six years old, spayed, and up to date on vaccinations.